leisure and so the opportunity was taken to revisit Long Dale and to show it to Anne. 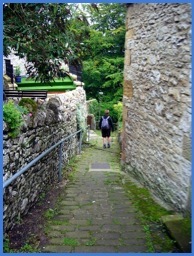 The route decided on was to drop down to the River Bradford via the steep alleyway (Bankside), located about 100 metres west of the Farm Yard Inn in the main street of Youlgreave. This is a very interesting descent as the houses that face over Bradford Dale have been built higgledy piggledy rather than being subject to co-ordinated planning but it does makes this descent interesting. river and followed it up stream initially along part of the Limestone Way. 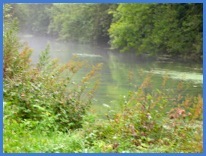 Although it was almost 11 o'clock as we walked along the river bank there was still a covering of mist over the water and a hint of dampness in the air. Dale is very beautiful it does not have the rugged splendour of nearby Lathkill Dale and because of this is less frequented by visitors which meant, with the exception of a couple of other walkers, we had the dale very much to ourselves as we walked towards Middleton. on our right lots of East German manufactured Trabant Cars in various states of repair and a car delivery vehicle which looked as if it was about to off load another selection for the collection.. It was then that I remembered a book I had read called The Hike by Don Shaw (he wrote the Dangerfield TV series) which detailed his exploits and those of two friends on their walks in the Peak District. One of these walks being through Middleton and talking with the owner of this array of Trabants. They were certainly an unexpected sight. and vegetation on both sides of the road. After almost a mile the lane did a sharp turn left and it was here we said goodbye to the solid tarmacadam surface of the lane and continued our southerly route along a narrow broken and generally ascending path bordered by vegetation, including stinging nettles that did their best to block our route, sting exposed limbs and make walking it as difficult as possible. It was therefore with some relief that we exited this part of the route, which was less than a mile in length, and arrived in open pastureland. Although walking this part of the route was much more pleasant the enjoyment was reduced with the arrival of rain and although waterproofs were needed it never got as unfriendly or as vicious as it had been on my previous walk in this area. However, Long Dale still looked a damp place when we finally looked down on it from the hillside. We then descended into it, passed the time of day with another couple of walkers before proceeding eastwards (left) along the dale's damp bottom. One of the more noticeable things about Long Dale, besides its steep sides and it raining on me when I visit it, are the lumps that are such a feature of the sides of this dale. I probably should know what they are, but I don't and I can't find any reference to them on the internet, in fact there are very few references to the dale itself, so if you should read this and know what they are or what caused them I'd be please to be informed. August 2009 - Have been informed by Chris Judd that It is "soil creep". 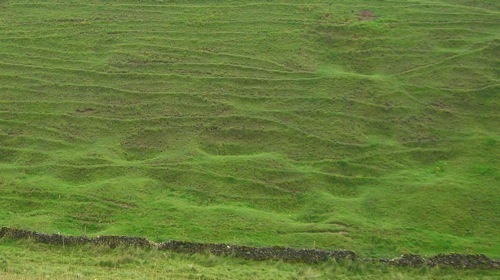 This happens in lots of steep sided dales, particularly when the soil is not very deep, therefore not a depth of root to bind the soil together. Thanks for that Chris. So along the dale we went, ignoring the dale that came in from the right from Pikehall, until the way ahead was blocked by the steep hillside. 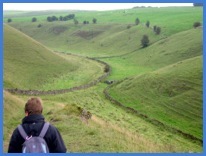 This is where we turned left, and continued to follow the obvious path which now entered Gratton Dale. soon the openness vanished and the path narrowed as it wound its way along a muddy and often rocky track with small trees and shrubs blocking views of the sides of the dale. Part way through the dale we came across a couple of groups of walkers resting. One group looked as if they were going to head into Long Dale while the other was going in our direction. As the route was single file most of the way we put a spurt on to leave them behind. I can't bear people breathing down my neck when I'm walking and I am sure they would not welcome me slowing them down. 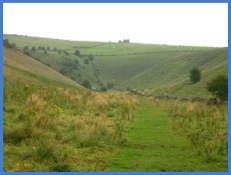 I can't think of much more to say about Gratton Dale except it would be enjoyable to see it when it was dry underfoot and less muddy, and I'm sure it would be a real treat in Spring and early Summer when the flowers are in bloom. 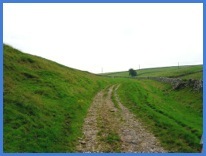 We left Gratton Dale and 'hit' tarmac at the appropriately named Dale End and having walked left up the lane a short distance we took the right fork before stopping outside Gratton Grange Farm for our refreshments. The road descended quite steeply as we got closer to Youlgreave and soon after passing Hopping Lane on our left we turned left off the road and soon we were back in Bradford Dale at the bridge we had crossed earlier that day. So now all that was left was the short steep climb between the houses back to our temporary residence. If you fancy trying this walk you will need the Ordnance Survey Explorer Map, 1:25000 Scale, for the Peak District – White Peak Area, No. OL24.